Hello and welcome to another preview season, and another Latest Developments! Today, I am going to talk about the development of Vehicles, and why I think they are so awesome. One of the reasons you have seen fewer and fewer Equipment cards, especially really powerful Equipment, in the last few years is because of how swingy the cards are, and how hard they are to deal with. It's easy to deal with one strong creature, but one strong Equipment turns all of your creatures into major problems for your opponent to deal with. Now, that isn't inherently a problem, especially if the cards are priced well, but we did a very poor job of costing Equipment in our first few sets. A lot of that was just how harsh Mirrodin was toward artifacts, but trying to play against cards like the Swords today is very hard. I think the Swords in Scars of Mirrodin could've cost an additional mana to equip and still seen Standard play...but we kind of needed to match up to the previous cycle. The problem with Equipment cards is they can easily turn each of your opponent's creatures into basically the same threat. Swords meant you had to deal with protection over and over again. An Equipment card that is very strong against your deck will be almost impossible to beat because of how same-y it makes all of the creatures. Beyond that, the knobs we have on Equipment aren't great because of how unevenly they scale, especially in Limited. Leonin Scimitar is fine, Vulshok Morningstar is hard to beat, and Vulshok Battlegear can easily dominate games in most formats. While we have no plans to stop making Equipment, we don't make the cards as strong as we make many of our other cards because of how hard Equipment is to interact with. Having to kill every single creature your opponent plays to turn Equipment off is difficult for certain colors or decks. Vehicles go very much in the opposite direction. We have a ton of knobs with them because of their crew numbers, and we can put a ton of different kinds of abilities on them. Most importantly, your opponent can interact with them once they have been crewed. That means a wide variety of decks can interact with them. It only takes one removal spell at the right time to deal with them, rather than forcing you to kill every creature that becomes equipped. While I really love how Vehicles played, getting to where we are now was not easy. There were certainly points during the design and development of the set where I felt the cards were basically unsalvageable. A lot of this was because the design implementation of Vehicles was different than what we ended up printing. But we also had a big problem in that the way the designers and developers looked at the cards was very different. This makes a lot of flavor sense (bigger Vehicles need more people to crew them), but it made the cards much weaker overall in most decks, and they heavily rewarded token strategies. Since, at the time, we were having issues with fabricate making 1/1 Thopters and people only choosing that mode, this was just another nail on the "no real choices" side with fabricate cards. It made the set heavily reward tokens, which wasn't something we really wanted. On the flip side, most of the Vehicles with this started out pretty weak. While the designers might have been happy playing a five-mana 6/6 vanilla Vehicle in their deck with crew 2, the developers felt like they needed something closer to an 8/8 with trample to bother playing the same card. That is just a huge swing between how cool the cards are and how powerful they were. Because of such high crew costs, it was very hard to run more than one or two in your deck. And a very likely outcome from trying to do the "cool thing" in Kaladesh Sealed was to lose with un-crewable Vehicles on the table. As a whole, the design team being very excited about a mechanic is good. But when the gap between how the designers and developers treat the cards is too wide, it usually means there is an underlying problem that needs to be solved. The designers are generally much more willing to do things that are a bit weaker if they are novel and interesting. And the developers tend to quickly filter through those and only do them if they are actually competitive. The good news is that this is a better problem to have than the opposite. When the developers are all playing a set of cards because of how strong they are in Sealed, and the designers leave them out because of how unappealing they look...we tend to end up with really boring, Spikey mechanics that are not nearly as fun as they are strong. It's much better to take the mechanics that are fun even when they're weak, power them up to what we would expect would be Constructed-playable, and see how people like them. Sometimes this doesn't work—many things are fun when they are a little weak and frustrating and annoying when they are actually powerful. For a while, we kept having Vehicles play into this space. The power that was needed for a crew 2 or higher Vehicle to actually be correct to put into your deck was incredibly high. And too much of the balancing point of the card was "sometimes you die without being able to crew it." The development team eventually ended up trying out power totals instead of creature totals, and it went a long way toward making the mechanic work. Changing to power helped right away for Limited, letting us create a wide variety of Vehicles that fit into very different decks—defensive ones, aggressive ones, and utility ones. It also let us create Vehicles with higher crew costs that could be over the top, but doable with actual creatures you would play in your deck. It also meant that "maximizing tokens" wasn't the default best strategy in Kaladesh games. From that point on, we had a lot of meaningful changes we could make to create fun Vehicles that pleased as many people as possible. Once we got them working for Limited, we still need to find designs and costs that could make fun Constructed Vehicles. Luckily, unlike Swords, we could make the cards individually powerful without worrying about them being too hard to deal with, since no matter how many keywords we put on them or how big they were, they could be killed with instant-speed creature removal. That meant we could be much more liberal with their stats, and make them very interesting on their own rather than being limited to just a +1/+1 to +2/+2 range that Constructed Equipment tends to play in. We could also ensure that their size and keywords were appropriate for each other, rather than having to cost them like an Equipment and know that double strike can as easily go on a 1/1 as a 9/9. If we wanted to make a 4/4 double strike Vehicle, we could just make that, and cost it to a point where it was maximally fun. Beyond just the knobs to balance them, Vehicles had a lot of advantages. They don't die to sorcery removal unless you decide to make them a creature to block. They survive board wipes—yours or your opponents—so they can be cards that can be good in or against control decks. They also give your summoning sick or "too small to get through" creatures something to do. All those mana Elves can team up to crew something in the midgame if you can't get them past a big blocker. What's cool about this card is that it is a very aggressively stated body—a two-mana 3/3 flier with the ability to let you loot is very strong. Because the crew cost is so low, you can easily play it in a variety of decks and use it to easily get in damage, or just to threaten Planeswalkers that your opponents play since few can easily protect themselves against the Copter. The looting ability, while not as strong as drawing a card (obviously), gives you a lot of options. The first and most obvious is madness. Attacking with the Copter and pitching a Fiery Temper will take out just about any Planeswalker. Also useful is its ability to enable delirium in any color deck. Once Gather the Pack and Jace, Vryn's Prodigy rotate out, Smuggler's Copter will still work in any deck to let you easily discard late-game cards, or just cards of the right types to quickly enable delirium. Vehicles do have downsides, though, which is important for any powerful card type that is difficult to interact with. The first is that they require enough creatures in your deck to actually crew them. While we do have a few that were made for more controlling decks, you really will have a hard time running 4 Smuggler Copters and 4 Fleetwheel Cruisers in the same deck, even though they are both very powerful. You need to pick and choose the ones that are right for your deck, and accept that sometimes you will draw three Copters and only one creature, and that will be a problem if the creature gets killed. Vehicles also work best when you are curving out, but can force you to overextend more than may be wise. Even though they are very strong for surviving board wipes, that doesn't mean you can always recover right away. 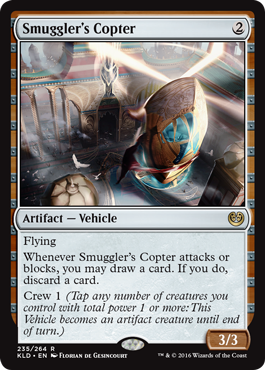 If you have two Vehicles out, you can just play two creatures and crew both (assuming you have enough power)—but that may be too slow to win a race through some removal. And going any wider leaves you vulnerable to board wipes, as you need to extend pretty far to keep the Vehicles running. If an opponent kills one of your Vehicles at instant speed then casts a board wipe, you might not have the resources left to really keep the pain train going. 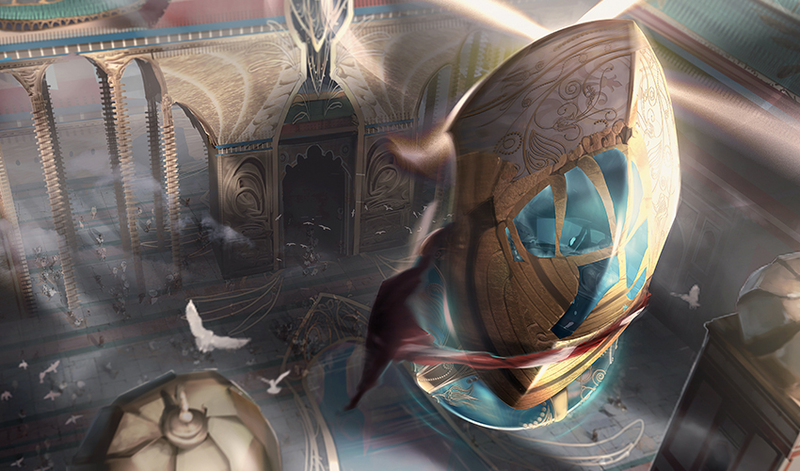 Vehicles are an important tool for many decks in the Kaladesh Standard and Limited environments, but one that you need to make sure you have enough creatures to enable. That kind of counter-play is really important for any new card type, and I think it does a lot to balance out Vehicles and make them a strong addition to Kaladesh. It also leaves players with a lot of interesting deck-building decisions and leads to a lot of very interesting games. That's it for this week. 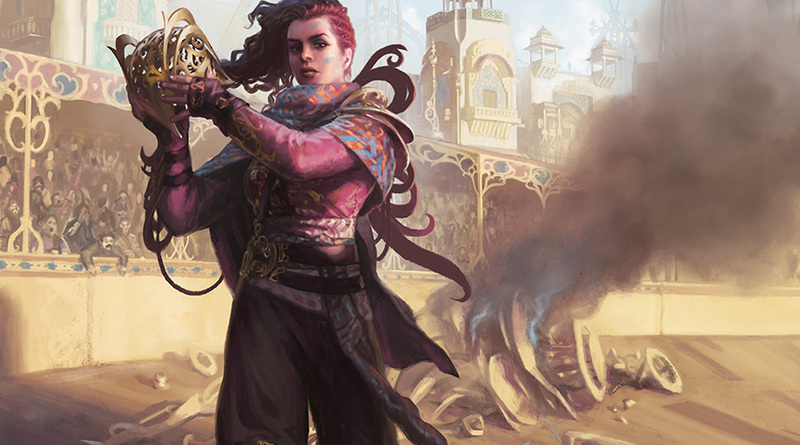 Next week, the full set will be live, and I will be talking more about Kaladesh's energy mechanic and what Development did to it.